Winter is around the corner, and that means that our beds become our favorite places to snuggle under the covers and stay warm. If there is one item to invest in before winter starts, it is a new comforter. Our comforters keep us cozy at night, and if we get one that is particularly warm, it means we can turn down the thermostat a few degrees at night and potentially save hundreds on our heating bill. At Designer Living, we offer a wide array of comforters that are well-suited for winter use. In this article, we will outline some key elements to be aware of when buying a comforter, how to choose a comforter, and tell you why our selection of down alternative comforters are the warmest comforters for winter use. Down alternative comforters are generally filled with cotton, polyester, or rayon. These materials are specially designed to mimic the lightweight fluff and heat retaining capabilities of genuine down. While there is no comforter fill material on earth that can match the warmth to weight ratio of a high-quality goose down comforter, down alternative fills have come a long way in recent years and they do a great job of retaining warmth without suffocating you with too much weight, while also offering an array of other benefits. A standout benefit of down alternative materials is their hypoallergenic nature. Down comforters are notorious for triggering allergies in sensitive individuals, but alternative fills have none of these issues. Alternative fill materials are man-made and do not carry the same dust particles as down, so those with allergies are in the clear with these blankets. While hypoallergenic down comforters are available, they are even more expensive than traditional down, which is already a pricey material. This brings us to our next benefit of down alternative comforters: affordability. 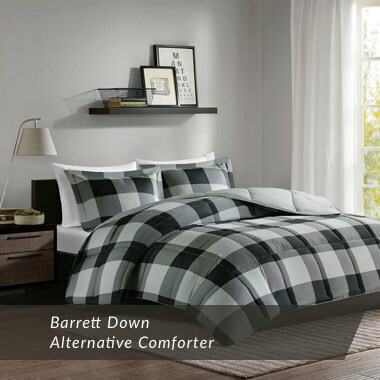 A down alternative comforter is cheaper than down, without a doubt. You can buy a high quality down alternative comforter for less than one hundred dollars, while you would be hard-pressed to find any down comforter of any quality for that price. The price difference stems from the fact that down material and filling is collected from the feathers of geese or ducks. Imagine the process of plucking feathers compared to the process of synthesizing a similar material. This not only means lower cost, but that down alternatives are a more eco-friendly option too. Not only is down alternative hypoallergenic, comfortable, and affordable - it is also an eco-friendly option. As with hypoallergenic down, there are options available that certify humane treatment of the birds which the down came from, but these materials cost a premium. Why pay extra for peace of mind when you could simply buy a comforter made of a synthetic material which does not come from animals in the first place? Down alternative comforters are quite durable and they are easy to care for without any expertise. Most are machine washable and you simply need to follow the instructions on the tag to keep your comforter clean and fluffy. This is a huge advantage of down alternative over down, as most down comforters have special washing instructions and may need to be taken to a dry cleaner. Some are not recommended for washing at all! 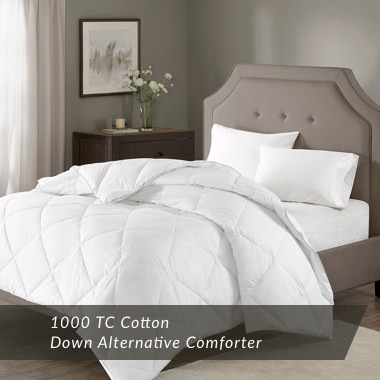 If you are looking for a warm, easy to maintain comforter, look no further than a down alternative comforter. Now that you are aware that down alternative comforters are the best comforters for winter, take a look at our extensive inventory to find a comforter that is right for you! We have many stylish, warm, and affordable options to keep you comfortable all winter long. Our bedding inventory includes all season comforter sets for all mattress sizes as well as options specifically designed for extra warmth during the cold weather months. With our wide variety of duvet and down-alternative comforter covers, you can customize the style and feel of your winter bedding according to your needs to get a good night’s sleep.